After Burning Amp 2017, member 6L6 and I drove to San Francisco airport and naturally we talked about diyAudio the whole way. 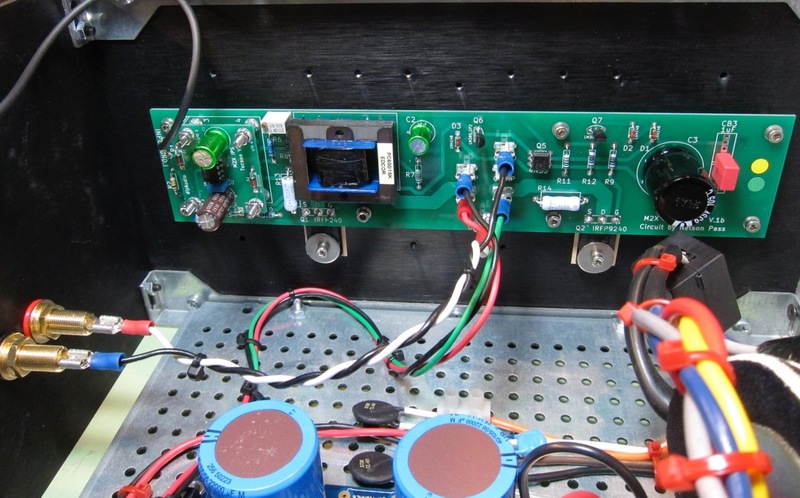 We imagined that many people would love to build a DIY version of the First Watt "M2" amplifier -- except that the M2 requires JFETs which are painfully difficult to source. Toshiba has stopped making them, and the Linear Systems replacements are hard to find too. (The diyAudio Store has been sold out of the most sought-after Idss grade for months and months). HOWEVER, we noticed that the JFETs were used only in the "input stage" of the M2 amplifier, to implement a unity gain buffer that drives the primary of an autotransformer. The remainder of the M2 amplifier uses components that are in active production, available from multiple different distributors, today. So I proposed that we lay out a new PCB for the First Watt M2 amplifier, with the input stage and its Unobtanium JFETs contained on a removable, replaceable, interchangeable Daughter Card. Now we can build input stage (unity gain buffer) daughter cards, with whatever components we wish. Of course one option would be (should be!) Nelson Pass's original design using Toshiba JFETs, for those who are willing and able to obtain them. And there will be other options too. Options that implement a unity gain buffer without Unobtanium parts. Fortunately it is not an impossible task to design a unity gain buffer which fits on a small daughter card. My feeling was: let's make it possible for people to build and listen to an M2 amplifier, at the same time they search the globe for JFETs. Months later, if and when they succeed in finding and purchasing JFETs, they can stuff and solder the JFETs onto a daughter card, swap it in, and keep listening. Or maybe, just maybe, they'll fall in love with the sound of the M2 without JFETs, and quietly stop searching. As we drove along and discussed it more, both 6L6 and I came to the conclusion that this sounded like a pretty exciting idea, and I began to work on the PCB layout and the input stage circuit design(s) during hobby hours. I'm now pleased to announce that revision V1 of the M2x amplifier has arrived. PCBs for the amplifier left and right channels (the "mother" boards) have been built. 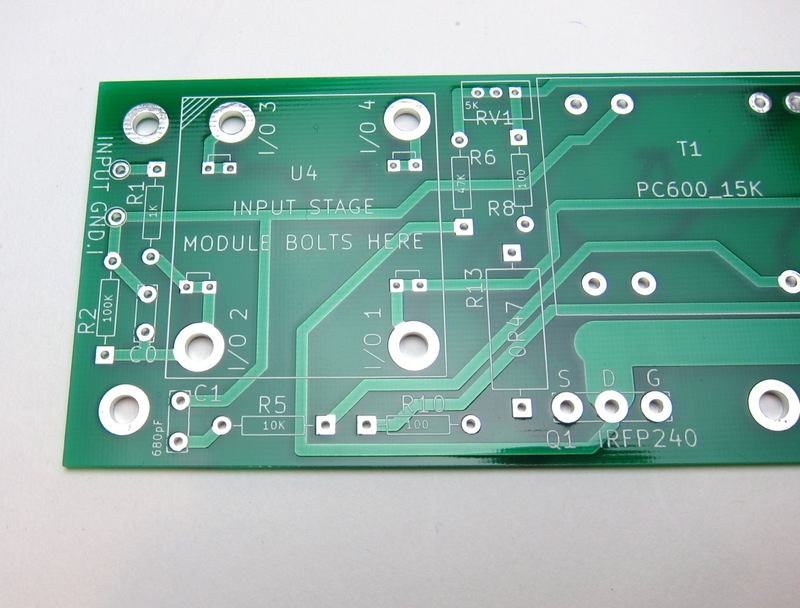 PCBs for five different input stage circuit designs (the "daughter" boards) have been built. I've shipped all PCBs and all daughter boards and all electronic components to 6L6's electronics lab, for one of his beautiful Build Guide jobs: Assembly and Step By Step Photography. 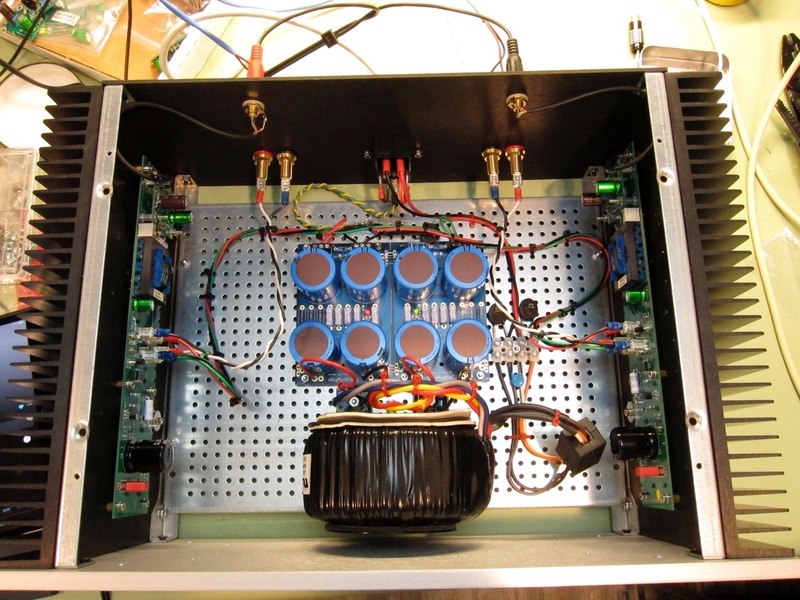 I'm very pleased to say that he has built the amplifier and a few of the input stages. It works. It sounds good. But 6L6 has a full time job and must fit diyAudio into his spare time. The Build Guide is not yet complete and won't be complete for a while longer. Similarly, my own build of my own M2x amplifier has begun but it is also not complete. That's how hobby projects work. While we wait for the Build Guide to arrive, I thought readers might enjoy looking at the circuit schematics of the M2x amplifier and its five different input stage options. 1. ISHIKAWA - Nelson Pass's original M2 input stage circuit design, using Toshiba JFETs made in Ishikawa, Japan. The PCB naturally also accepts Linear Systems JFETs. 4. NORWOOD - A two-chip unity gain buffer using an extremely high current video driver IC, plus a front end JFET opamp made by Analog Devices in Norwood, Massachusetts. How might someone choose which of these to build? (Or, which of these to build first?) Here are some thoughts. ISHIKAWA (using Toshiba or LS JFETs) has the absolutely lowest parts count and is the easiest to solder together. But those FETs are hard to find. TUCSON using the thru-hole OPA604 chip, is the lowest parts count board that doesn't use unobtainium devices. And the OPA604 opamp has JFET inputs, so if you love JFETs, it's one of the opamps you probably know and adore. TUCSON using the SMD OPA1611 chip, is the lowest distortion input stage of them all. Even lower than the Nelson Pass original. It only has one surface mount part; the rest of the board is thru-hole. NORWOOD is all-SMD, just like the entire electronics industry has been for the last 20 years. 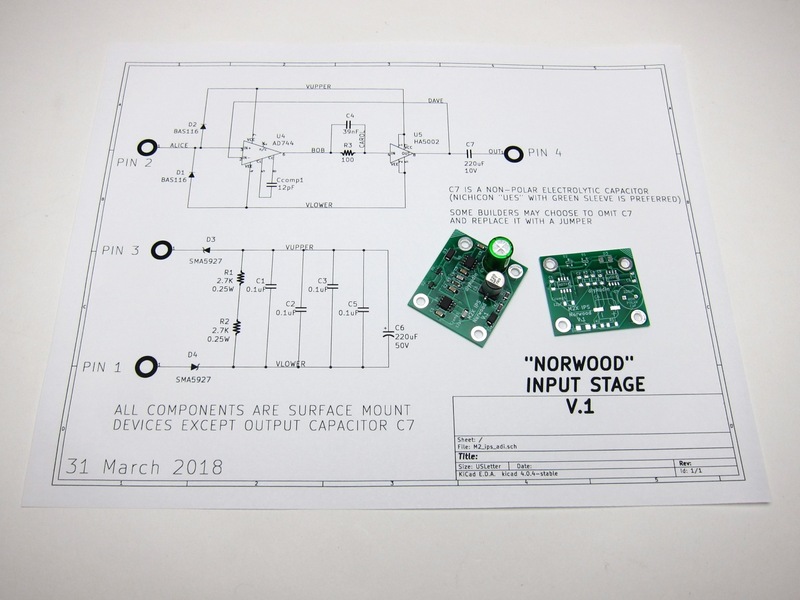 Norwood includes a 200 mA driver IC, and a JFET input opamp from Analog Devices. Its output current capability is at least a factor of five greater than any of the other M2x input stages. If you're at all concerned about the input impedance of the output devices at HF, reflected from the transformer secondary back into the primary, Norwood can drive it better than all the others. 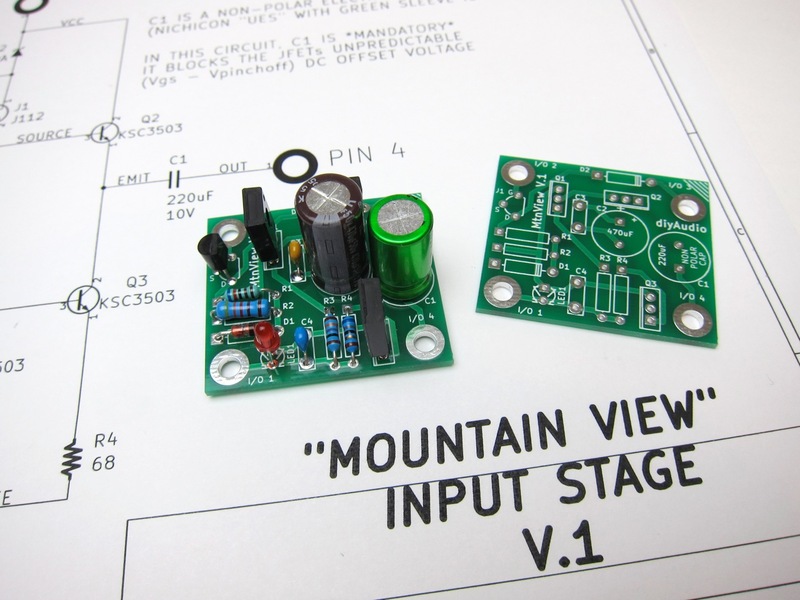 MOUNTAIN_VIEW uses single-ended, class A, discrete circuitry and no feedback. If you are a big believer in single ended class A, if you love this quote from a famous article by Nelson Pass: "For reproducing music as naturally as possible, push-pull operation is not the best approach. Air is not symmetric and does not have a push-pull characteristic. ... Only one linear circuit topology delivers the appropriate characteristic, and that is the single-ended amplifier. Single ended amplification only comes in pure class A," then you probably are interested in listening to the Mountain View input stage. AUSTIN is a thru-hole board with 4X more components than the other boards; its resistors are mounted vertically to save PCB area. This permits a Diamond Buffer circuit with high performance, precision current source loads. Builders who love parts substitutions / optimizations will appreciate that Austin's PCB silkscreen doesn't indicate transistor orientation. Instead, transistor pins are labeled B, C, E in a perfect circle; allowing you to drop in Japanese 2SA/2SC transistors (pinout ECB) or European BC transistors (pinout CBE) or American 2N transistors (pinout EBC) however you please. Austin is recommended ONLY for experienced builders. If you're a newbie, hire someone to solder your Austin board!! First, 6L6 and I work on finishing our respective M2x amplifiers in our respective spare time. This includes building and listening to all versions of the input stage daughterboards. Second, 6L6 posts his photographic Build Guide here on diyAudio. Third, if the amplifiers work well and sound good, I'll offer my approximately 30 sets of PCBoards (2xAmp plus 8xInputStage per set), if anyone wants to try the M2x. Fourth, if I happen to sell out, 6L6 and I will put our heads together to figure out the next move. Yep. I bummed a ride. I needed to go to SFO and get on an airliner home. It’s not that I didn’t have the money for an Uber, but that I took the oportunity to have a 1/2 hour chat with Mark. You see, my entire point of going to Burning Amp is to actually see and talk to the people we interact with in the forums - this is a smart, fun, and neat group of people, and it’s wonderful to actually see faces and chat during lunch while looking over the bay. If you have the ability to go to Burning Amp Festival, I highly suggest you do! It’s great. Ishikawa - Want to build the “original” M2? Use this, and omit RV1 and jumper C1. Want to adjust your 2nd harmonic distortion? Install RV1 and get out the test software or hook it up to your distortion analyzer. Want to guarantee there’s no DC flowing through the auto dormer and saturating the core? Install C1. Mountain View - This is the one that started the whole conversation. My memory is Mark saying, “why don’t I lay out a Firstwatt amp to use Fairchild Jfets?” Realizing that the M2 has no presence in the diyAudio Store and knowing that Linear Systems isn’t able to provide many of the Toshiba replacement transistors anytime soon, this seemed like a simply wonderful idea! The daughter card feature was quickly thought of, and that’s what we’ve got. Tucson - Want to try different opamps? This is the board for you. Get a socket and some different single DIP-8 opamps. swap them in and out and see if you like one more than another. Remember to choose ones that are unity-gain stable. The addition of SMD pads allows for use of modern parts, as most of the made-specifically-for-audio new opamps are only available in SOIC-8 or other surface-mount parts. Never soldered surface-mount? It’s not that hard, and the parts used on this project are solderable by humans. Anyway, I’ll try to make a quick and easy video or something to show how easy it is. TL;DR of this post - M2x. Sounds really fantastic. Build as originally designed AND/OR with different buffer stage. Daughter cards to swap front-ends. Last edited by 6L6; 10th May 2018 at 02:29 PM. (a) You’ll need a heavy set of “dykes” (wire cutting pliers) to cut individual blade connectors off the reel. Mouser ships them all connected together and wound into a reel, it’s your job to cut them off one by one. Don’t even try to use your electronics‐grade, precision wire cutters that are meant to nip off excess length from quarter‐watt resistors, you’ll dull those in 15 seconds. Get the tool you’d use to cut a wire coat‐hanger in half. (b) I am glad I spent $15 to purchase a set of metric Nut Drivers from Amazon. These are screwdrivers but instead of a blade at the end, they have a hex socket. They make quick work of tightening up the large number of hex nuts connecting the Amp Main Board to the heatsink. More importantly, they are sure and precise when tightening up the nuts that connect the IPS Daughter Board to the Amp Main Board. (c) Look into your heart and decide whether you want to spend $2 for a “Bourns H‐90” screwdriver from Mouser. It’s 99% plastic except for the tip, so it won’t create an electrical short circuit if you accidentally drop it into the guts of a live, powered‐ up Class A amplifier, while you’re performing output offset adjustment on the trimmer potentiometers. Remove the pocket clip! 2. Jumpers. When you look at the amplifier main board, you’ll see four white U‐ shaped markings inside the rectangle where the input stage module is bolted. Look for the text “I/O 1” , “I/O 2” , “I/O 3” , “I/O 4”. The U‐shaped markings are less than 1cm from those pieces of text. Just bend some scrap AWG22 wire into a U shape (resistor cut‐off leads are perfectly fine too), stuff into the component side, add a piece of masking tape to hold it in place while soldering, and solder both ends on the back. Trim flush, remove tape, done. The purpose of these jumpers is to provide a safety backup, and a backup‐to‐the‐backup, guaranteeing that the bolts are electrically connected to both sides of the amplifier main board. Even if the plated‐through‐holes somehow become no_longer_plated on this board. Yes we are preparing for a very unlikely tornado‐during‐earthquake event. But the cost of preparation is zero, so: why not? 3. WARNING: BLASPHEMOUS HERESY! DO NOT READ THIS! Some DIY builders of the M2 amplifier, using the very fine “Tea‐Bag” circuit board, have reported a problem to the diyAudio forums. Their M2 amplifier’s output offset voltage is negative, and no setting of trimmer resistor RV1 removes this negative offset. I would like to gently mention a possible fix: leave R7=47K, but change R6 to 37K and change RV1 to 20K. Now (R6+RV1) can vary from 37K to 57K, in other words, from (10K less than R7) to (10K more than R7). This lets you null out either polarity of offset voltage. However, to faithfully reproduce Nelson Pass’s original M2 design, the M2X schematic and PCB silkscreen do not include this modification. M2X has R6=47K and RV1=5K. If you decide to make this R6,RV1 modification on your M2X, don’t tell anyone. And don’t quote me. 4. PCB GND The silkscreen text on the M2X amplifier board, and the text on the M2X schematic diagram, calls out three different grounds. GND.I is the input ground, the second wire in the two wire pair which connects the input jack to the amplifier PCB. GND.P is the power ground. There are two twisted pairs of wires which connect the amplifier board to the PSU board. One twisted pair is (VPOS and GND.P), the other twisted pair is (VNEG and GND.P). The connectors for VPOS and GND.P are placed close together for easy wiring. Similarly the connectors for VNEG and GND.P are placed close together for easy wiring. GND.O is the (optional) output ground. If desired, you can connect a twisted pair of wires between the amplifier board and the loudspeaker output jacks: (OUTPUT and GND.O). 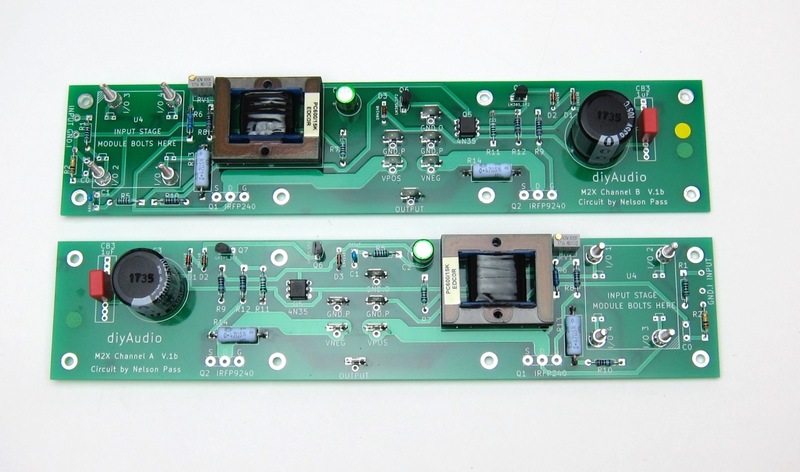 However many builders find that hum and noise is reduced if the speaker ground is connected on the PSU circuit board rather than on the amplifier circuit board. Try them both and see which you prefer. 5. Capacitor “C0” is not present in the original M2 amplifier by Nelson Pass. The M2 owner’s manual explains that this makes it easier for tube preamps to drive an M2. However C0 does perform a useful function: together with input resistor R1, it filters (removes) unwanted radio frequency interference. The transformer’s HF rolloff helps too. I suggest that if you’re absolutely certain you’ll never drive M2X with a tube preamp, never ever ever, consider soldering C0 into the amplifier board. C0 is a NP0/C0G ceramic capacitor, 50 volts, 220 pF. Of course you can cut it out later if you change your mind. 6. Assembly Sequencing. Here is my suggested order in which to stuff and solder the components on the amplifier main board. ii. All resistors Rnn except 3W parts R13 and R14. If you use a resistor lead forming tool (like the Sparkfun TOL‐13114), you will quickly discover that the small resistors need their leads bent to 0.50 inch pitch (12.5 mm). iii. C1 and (if you so choose!) C0. vi. The Edcor transformer. Gently try both orientations, use the one that fits very easily. Tape down with a lot of masking tape before soldering. (Ethyl alcohol is sold in the USA as “Denatured” – with trace amounts of poison added to discourage people from drinking it). If your grocery store and your pharmacy don’t carry it (look in the First Aid section), try the paint department of a big‐box home improvement store like Lowes or Home Depot. It’s used to thin shellac and other varnishes. Flood the board with 99% alcohol, give it a good scrub with the toothbrush, rinse with alcohol. Do this at least 3 times – solder flux leaves a hazy film even at very low concentrations. Then I flood one more time and scrub with a big wad of clean toilet paper. Somehow the wiping plus absorption of the TP gives superior results. A last flood of alcohol to rinse off the TP fluff, and then dry with a pistol shaped hair blow‐dryer on low heat setting. Your PCB is now clean and beautiful and ready for glamor photos. Last edited by 6L6; 12th May 2018 at 04:16 PM. I'm using this post to add some more of Mark's wonderful builders notes, this time for the specific input cards - enjoy! 1. Trimmer pot. The 200 ohm trimmer potentiometer RV1 does not appear in the original M2 schematic. But Nelson Pass did include it in subsequent amplifiers (e.g. F5 Turbo), allowing methodical super‐optimization of the phase of the second harmonic, which listeners find extra pleasant. So I put this potentiometer into the M2X schematic and PCB, simply to provide builders that option, if they wanted it. Install RV1 or not, as you wish. 2. JFETs. I gently recommend that you install the hard‐to‐find JFETs, as high as possible off the PCBoard. So high that you don’t need to trim the leads after soldering. Why? If you ever decide you have a better use for those JFETS than this Ishikawa daughter card, you want it to be very easy to desolder them without damaging the JFETs. 3. Output capacitor. Nelson Pass’s original M2 amplifier did not include capacitor C1. If you want to exactly replicate that circuit, omit C1 and install a shorting wire between its terminal pads on the PCB. On the other hand, if you’re concerned about mismatched JFETs producing an output offset voltage, which DC‐ magnetizes the core of the transformer, you may want to include C1 in your Ishikawa build. It’s completely your choice. Mountain View adheres to this philosophy. Its circuit design is a single ended follower operating in pure class A. The bias point is regulated (twice! ), giving very stable class A bias currents, with excellent temperature stability and PSRR. 2. Transistor Orientation. Bipolar transistors Q1‐Q3 are encased in medium power packages called TO‐126. These three parts are marked on the PCBoard silkscreen as rectangles. Each rectangle has a double line along one of its four edges. That double line signifies the REAR of the transistor, i.e., the side where the part number does NOT appear. The FRONT of the transistor is the side where the part number DOES appear. 3. LED Orientation. The LED is marked on the board with a diode symbol, having a double line on the cathode. The flat spot on the otherwise round LED package, is its cathode. Or just test the LED using the “diode” setting of your multimeter as a double‐check. Do not substitute any LED part number except the one stated in the Bill Of Materials. Notice the BOM says do not substitute. Mountain View was tested and characterized with this one (very widely available) LED part type; don’t screw up your build by using the wrong LED, when you can buy the correct one from Mouser, DigiKey, Arrow, Element14, etc., for less than 75 cents. 1. Hand‐soldering this surface mount PCB. I intentionally chose the physically largest SMD parts available, to make it less challenging to solder a Norwood board. Resistors and capacitors are in the big fat 1206 package (big and fat for SMD anyway!). ICs are in the SOIC‐8 package, which is one of the easiest packages to hand solder. Special diyAudio footprints are used on the board, having extra copper to give you more room to feed in solder. 2. Integrated Circuit orientation (Pin 1). The silkscreen outline of the SOIC‐8 package includes a large rectangle which denotes the package body, and a small rectangle, which denotes orientation. The small rectangle is on the end of the chip with Pin1 and Pin8. I’ve also placed a DOT on the PCB, next to Pin1. When you have the Norwood board oriented so the text “U4” and “U5” is right side up, the part number lettering on the ICs should be upside down. See the Build Guide by 6L6 for photos. 3. Recommended soldering order. I suggest you solder all of the resistors first, just to polish your SMD skills a bit. Then solder the small capacitors (all but C6 and C7). Third, solder the two ICs. Fourth, solder the big zener diodes D3 and D4. Fifth, solder the 3‐pin diodes (!) D1 & D2. Sixth, solder C6 and C7. Done! Remember: apply lots of flux, go slowly, and use a magnifier. 1. Tight Layout. Austin crams a LOT of electronic parts onto a 40mm x 35mm printed circuit board. Components are close together, making it easy to accidentally create a solder bridge that shorts two nodes together. I gently suggest that Austin might be a little too much of a challenge for beginners, newbies, rank amateurs, and oh so casual builders. If you haven’t soldered at least ten other PCBs already, I recommend that you hire a very experienced person to stuff and solder the Austin PCBs for you. Austin boards are quite a bit more busy than the other M2X input stage daughter cards. If you decide to solder your Austin boards anyway, please make sure you’ve got adequate lab equipment to, at the very least, apply the requisite ±25V DC power supplies and measure the supply current. If you’ve got an incorrectly assembled board, it’s vastly preferable to have it catch fire on your lab bench, near your lab fire extinguisher, rather than inside your M2X amplifier. 2. Transistor Orientation. I expect that many builders will substitute different bipolar transistors in their Austin boards, either to use what they’ve already got, or to “improve” the Austin circuit, or to avoid ordering a new transistor type they’ve never used before, with a goofy sound prefix (KSA/KSC?? c’mon, really?). So I’ve used a PCB footprint that is circular and symmetric. it will accommodate American transistors with EBC pinout. HOWEVER, it is the builder’s responsibility to look up the pinouts of the transistors s/he is using (it’s on the datasheet), and to correctly orient the transistor on the board so the Emitter pin goes into the hole labeled E, the Collector pin goes into the hole labeled C, and the Base pin goes into the hole labeled B. It is very easy to make a mistake when doing this; I got it wrong myself when building early prototypes of the Austin board. Go slow, be careful, and check your work. Twice. 1. Choice of IC. Tucson includes PCB footprints for both DIP‐8 and SOIC‐8 opamps; you can stuff and solder either one. If you decide to use the DIP‐8 footprint, it would be a good idea to solder a high quality DIP socket to the board. This permits “opamp rolling” at some future date. The thru‐hole opamp recommended in the Bill Of Materials is the Burr‐Brown OPA604: the same opamp found in the Pass Labs WHAMMY headphone amp. When substituting, make sure you choose opamps rated for at least 30 volts of total supply (VCC minus VEE). Many of the newest and best opamps from Burr Brown / TI, Linear Technology, and Analog Devices are only available in SMD. That’s why the Tucson daughter board also includes an SOIC‐8 footprint. The BOM calls for the OPA1611, which is an ultra low noise Burr Brown opamp, with the lowest datasheet distortion spec of them all. 2. 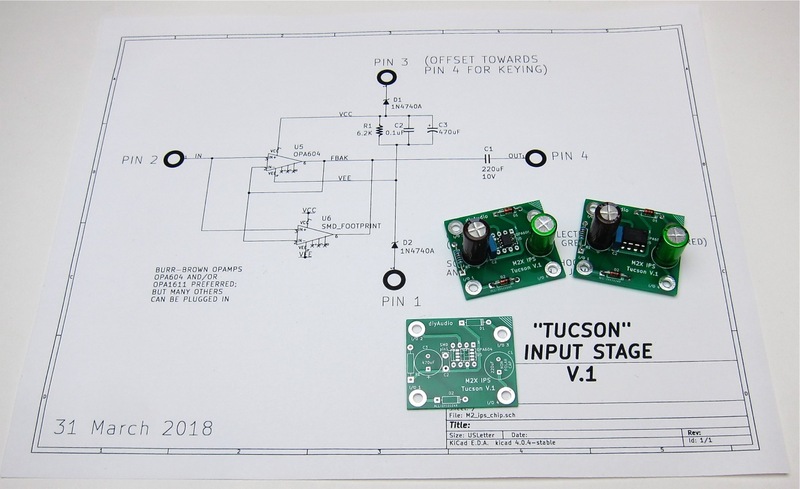 Consider building two sets of Tucson boards. I don’t see any good reason why you shouldn’t build two Tucson boards with OPA604 thru‐hole opamps, and then build two more Tucson boards with OPA1611 SMD opamps. Listen to both in your M2X; which opamp sounds best to you? Check the diyAudio “Swap Meet” forums, there is probably a thriving aftermarket for individual M2X daughter boards. People buy a full set of ten daughter boards, use four of them, and then decide to sell or trade the others. 3. Pin 1 indicator. The thru hole footprint for the opamp has a square pad where pin 1 goes. It also has the numeral “1” on the front silkscreen, next to pin 1. The SMD footprint is rotated 90 degrees counterclockwise (so the pads won’t collide!) Its pin 1 is marked with front silkscreen text, and with an arrow. To do list number one. This is lovely. Thank you Mark and Jim! told ya that this is wakoo one !! Last edited by Blk Dynamite; 26th April 2018 at 06:26 PM. On the Norwood, how did Dave elbow Ted out of the picture?